Firstly, many apologies for the time it has taken to write this report. The data were quite complex, and the day job comes first. This is a monster blog post, so make a cup of tea and settle back somewhere comfy! 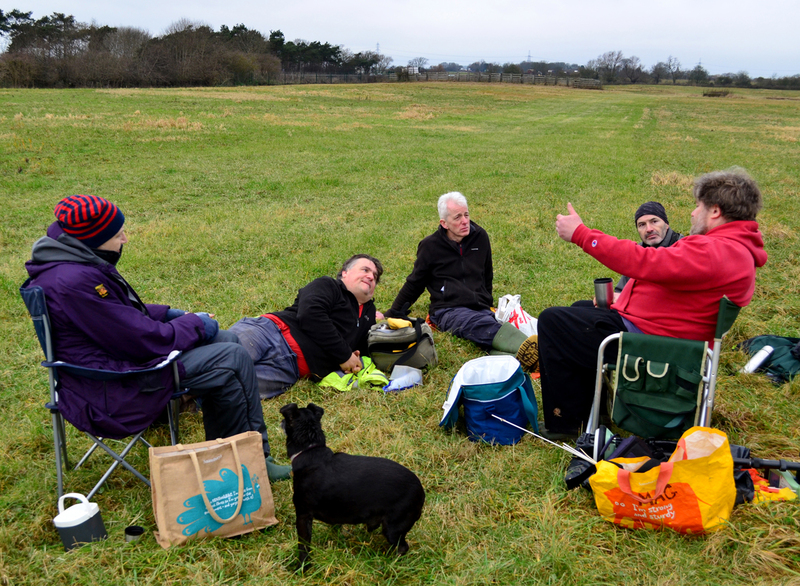 Last year CAGG teamed-up with local groups to undertake some survey at the Roman ‘small town’ of Durobrivae, near Peterborough. If you have ever driven on the A1(M) past Peterborough you would have passed by the site. 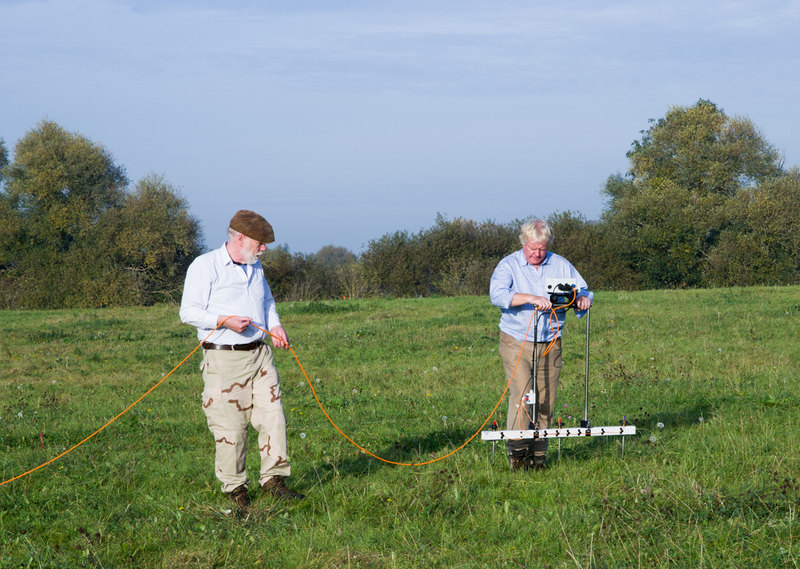 Our aim was simply to determine which geophysical survey techniques would give good results at this site. The answer was: all of them! 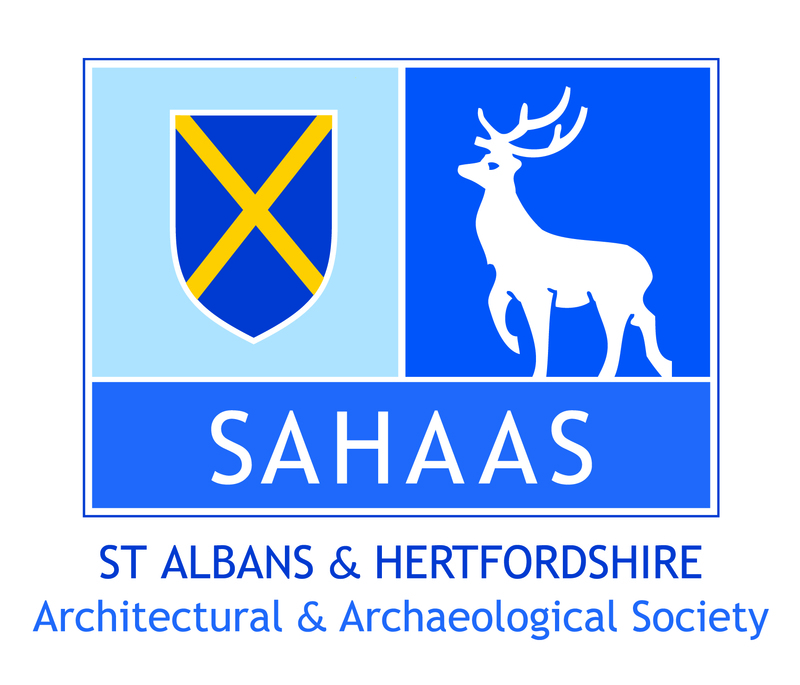 A short note on the results has just been published in the International Society for Archaeological Prospection‘s newsletter. We decided to add to our original survey by undertaking another three days work from 4th to 6th November. Unfortunately, it decided to rain in the morning of the first day and so we lost some time. 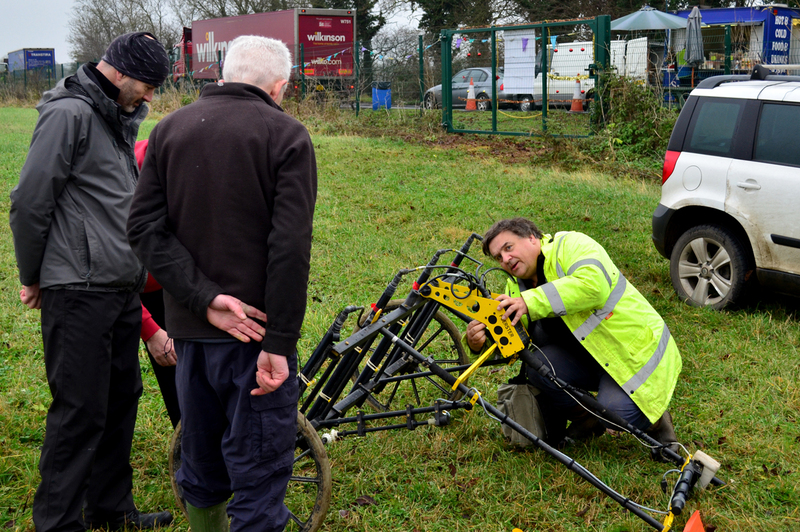 We had enough helpers to run the mag, two Earth Resistance meters (the Welwyn Archaeological Society‘s and UCL‘s) and the Malå GPR we had on loan from SEAHA. 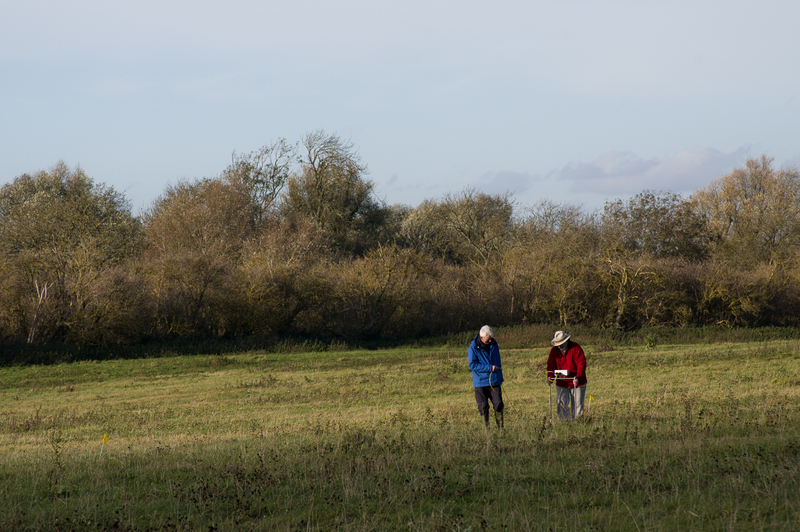 A small group of us returned on 26th November to expand the magnetometry survey and undertake a topographic survey using the dGPS. The first three figures just show how much we have done so far. Fig. 1: the complete mag survey as of the end of November 2017. Fig. 2: the complete GPR survey as of the end of November 2017. Fig. 3: the complete Earth Resistance survey as of the end of November 2017. In the following post I am going to firstly discuss the western block of data, and then the eastern block over “the tumulus”. Last year we completed a 80m x 360m transect of mag data across the town. We also completed two blocks of GPR data, one 80×80, and one 80x40m. This year we wanted to fill in the gap between those two blocks so surveyed another 80x40m block giving us one contiguous 80x160m survey. Unfortunately, matching GPR grids is quite difficult, especially when there is a year between when they were collected, and therefore quite different ground conditions. I did, however, manage to produce some “OK” time slices by applying a zero-mean traverse to each line of GPR data. Hopefully, I will be able to create better slices in future, but these will do for now. I also noticed that Larry Conyers had produced a much clearer plot of the temple by using a much thicker time slice. I usually aim for 3ns thick slices. Larry, however, used 8ns slices. Here I have compromised by using 5 1/4 ns slices with a 50% overlap. Fig. 4 is a composite of 12 slices starting at the surface. Fig. 4: twelve time slices of the western area. Each slice is 5.27ns in thickness. 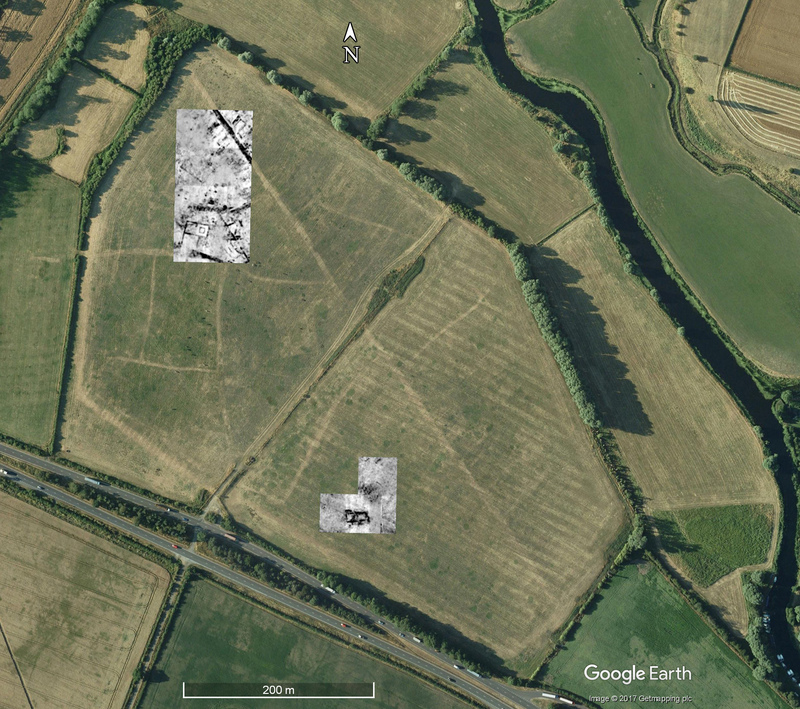 Apart from Ermine Street cutting across the top right hand corner, the first three slices are not really showing anything much of interest. Let us now look at the individual slices in more detail. Fig. 5: GPR time slices 4 and 5. 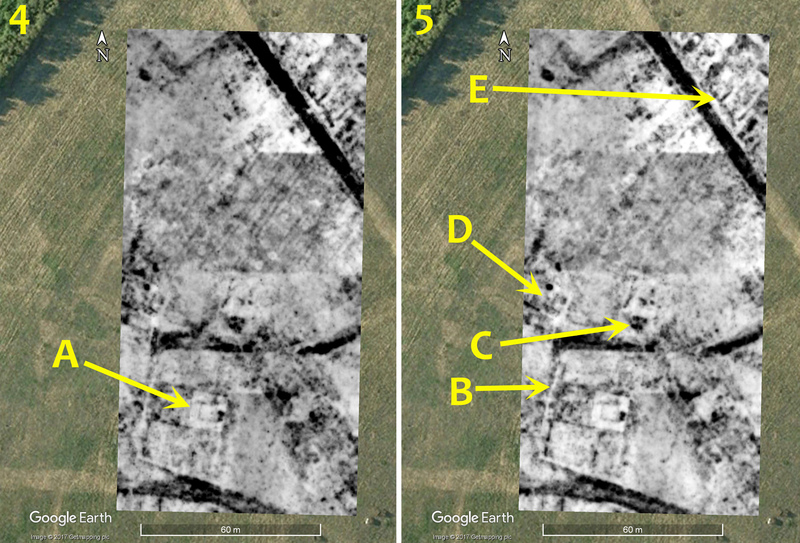 In Figure 5, left, we can see the temple (A) starting to show as an area of lower reflections. Larry Conyers was able to demonstrate that the interior of the temple building was clear of rubble, and thus there is little to reflect the radar waves. In slice 5 on the right, we can see a linear feature (B) to the west of the temple. This lines up perfectly with a strongly magnetic feature and is therefore a narrow cut feature like a ditch or possibly a wall foundation. There are faint hints of buildings with robbed-out walls at C and D, showing as light areas of low reflections. 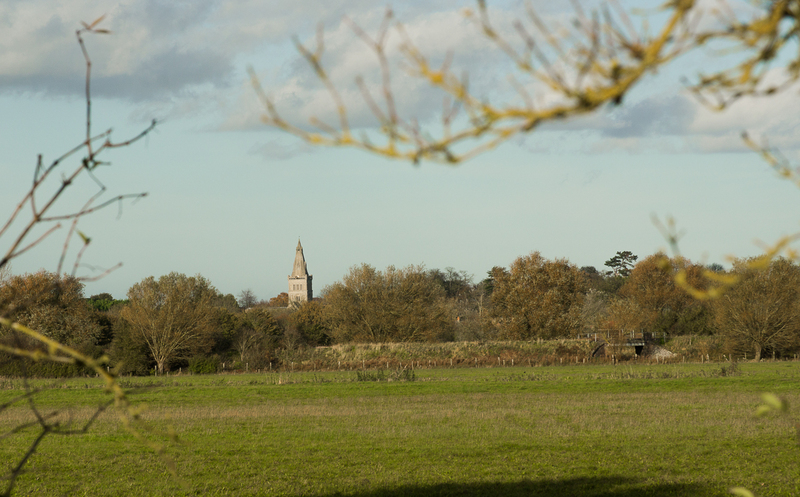 Similarly, at E, we can see some of the buildings alongside Ermine Street. Fig. 6: GPR time slices 6 and 7. In Figure 6, left, at A, we can see one of the minor side roads off Ermine street starting to show. 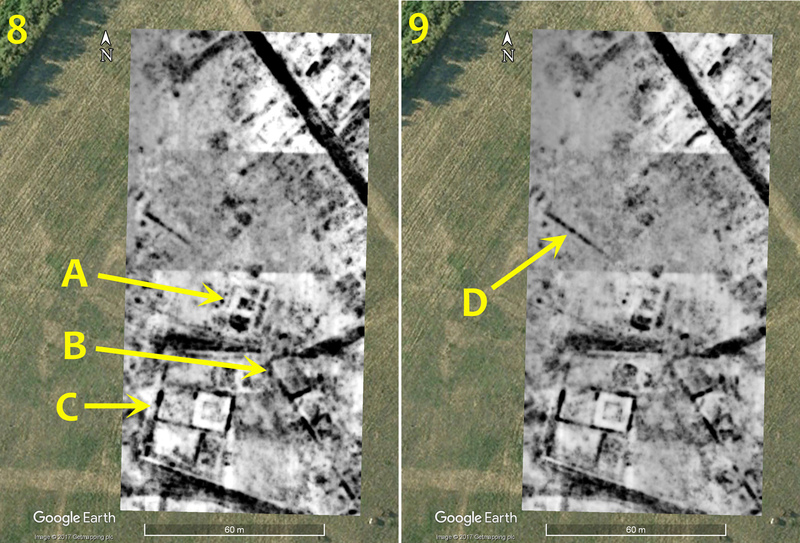 The building at B is still visible (just), and we are can start to see a wall parallel to the linear feature we saw previously (Fig. 5, B). This suggests to me that we are dealing with a cut feature rather than a robbed wall. Slightly deeper, in Fig. 6, right, at D we can see more buildings alongside Ermine Street. The square building at E is now showing more clearly. The large building at G is beginning to show quite clearly at this depth. I am puzzled, however, that the road coming from the east seems to end in a sharp angle at F, as though something has cut through it. Fig. 7: GPR time slices 8 and 9. In Fig. 7, left, at A we can now see the building to the north of the temple very well. It would appear the walls have been robbed but some of the floors left intact. At B, the large building to the east of the temple is showing very clearly now. The wall along the west side of the temenos of the temple (C) is showing clearly at this depth. Starting to show, but more clearly in the next depth slice at D, is a long wall running across the site. There seems to be an almost entrance-like feature in it at the western end. Fig. 8: GPR time slices 11 and 12. Fig. 9: the Earth Resistance survey (lower half) overlain on the GPR data (faded out a little). Figure 9 shows the Earth Resistance survey. We added a single line of grids on the eastern edge of the block we did last year. There is a strange speckly effect in the new strip. This block of grids we did with WAS’s TRCIA meter. The resistance values were very high, and the meter had to keep swapping range which, apart from slowing us down in the field, may be the cause of the rather odd looking results. The main result in the new strip is the high-resistance line running WSW to ENE which is probably a road. 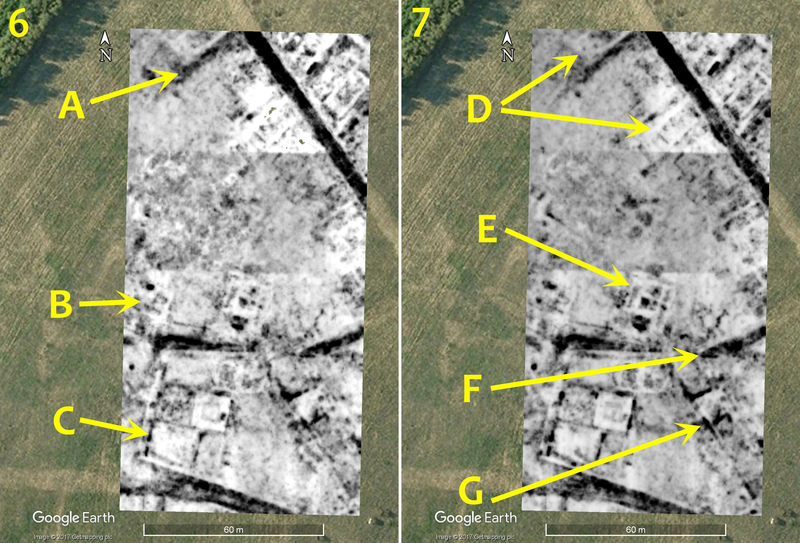 A comparison with Stephen Upex’s transcription from aerial photographs is quite informative (Fig. 10). Fig. 10: Transcription of the aerial photographs for the temple complex by Stephen Upex. The image has been rotated to match the geophysical surveys. © Stephen Upex, reproduced with permission. 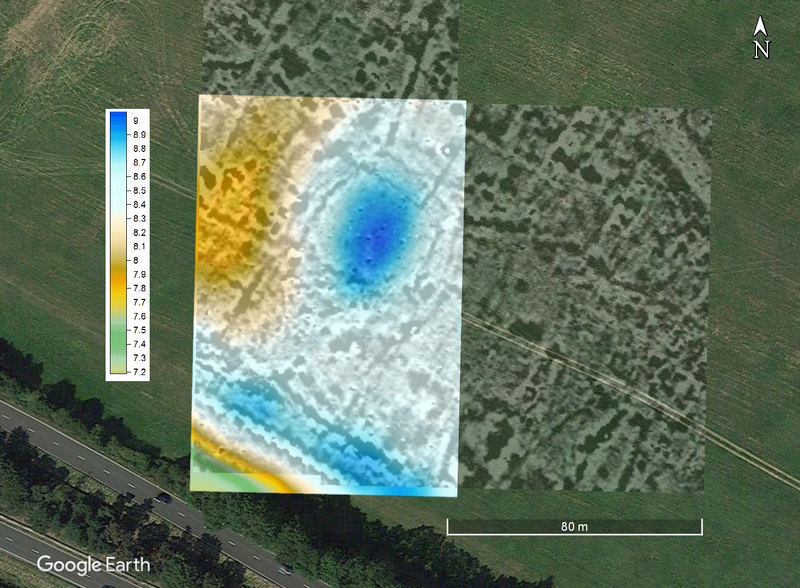 Some of the details between the aerials and the geophysics agree quite well. The temple itself, and the temenos are pretty good. What about the circular shrine? 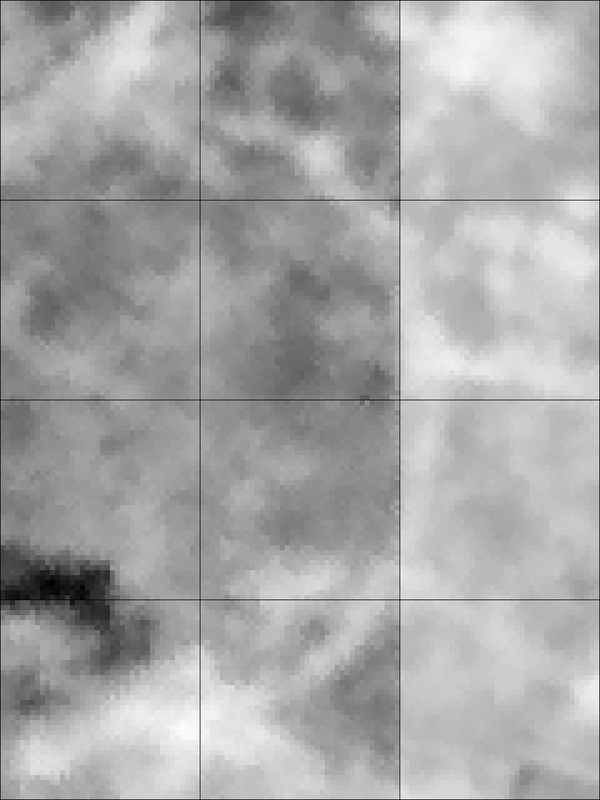 I reprocessed the GPR data from just that section using 6.5ns thick slices this time. 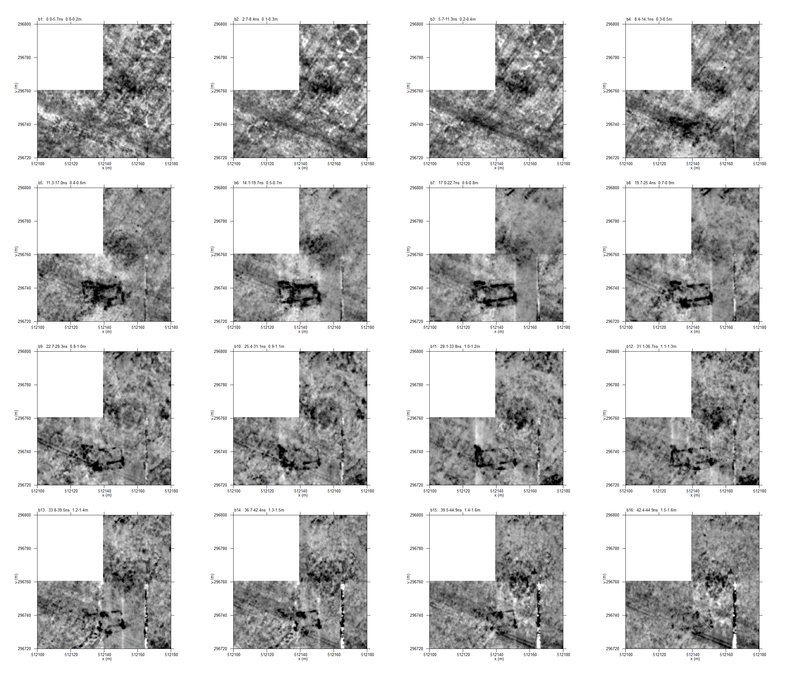 I have produced an image of slice 6 (16.04 to 22.49ns) in the variety of palettes offered by GPR Slice (Fig. 11). Fig. 11: GPR time slice of the area to the immediate north of the temple in a variety of palettes. The building to the north of the temenos shows quite well. There are hints of a circular structure just to the north of the main temple building lying underneath a robbed rectangular building. The circular feature shows quite well in the last palette, and the antepenultimate one. The rectangular building is clearer in the second slice where black is showing areas of low reflections. There is clearly a great deal which can be teased out of this data, but let us move on! The second area we surveyed was over the so-called tumulus towards the western side of the town. The mound showed quite nicely last year when the evening mist rolled in on the last day (Fig. 12). Fig. 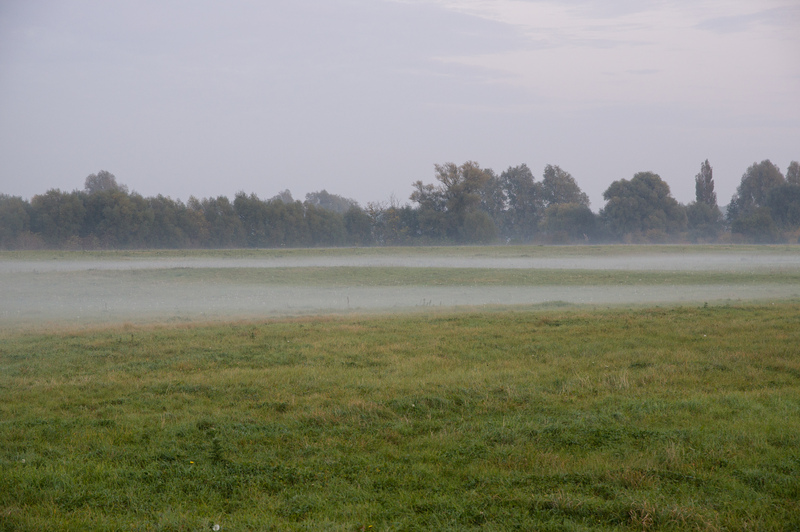 12: The mist shows the location of the “tumulus” beautifully. Our aim was to survey the mound using all three techniques. Unfortunately, the half day we lost to rain resulted in not covering quite as much ground as we hoped. The mag results were especially interesting, hence our return to expand the survey area a few weeks later. Fig. 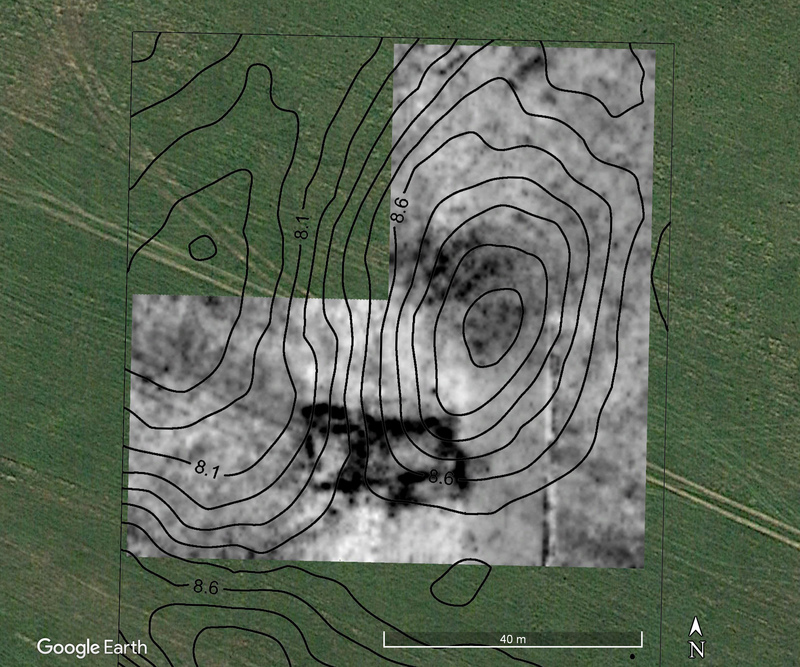 13: the magnetometry survey of the eastern area over the “tumulus”. Figure 13 shows the magnetometry results. Ermine Street and the minor road running off it show well. The town wall also shows clearly. The zig-zag look to the wall is not “stagger” in the usual sense of the odometer being incorrect, but a result of the cart going up and down a steepish slope resulting in the sensors not being vertical. 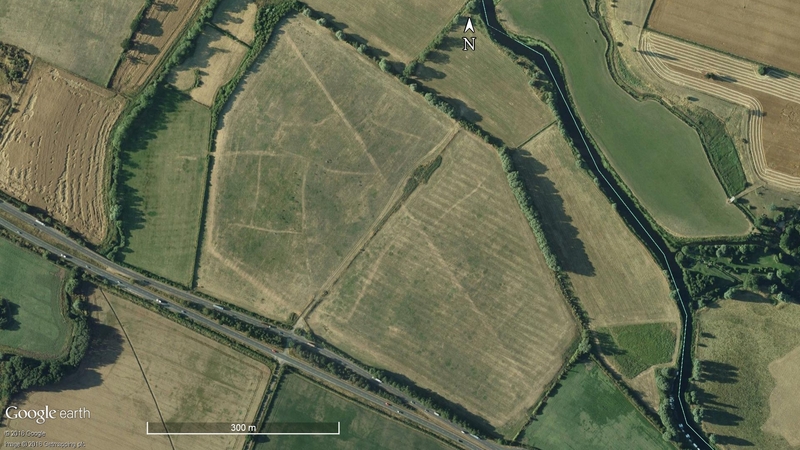 There are indications of more long, thin buildings coming off Ermine Street at right angles, and plenty of other pits, ditches and other features. 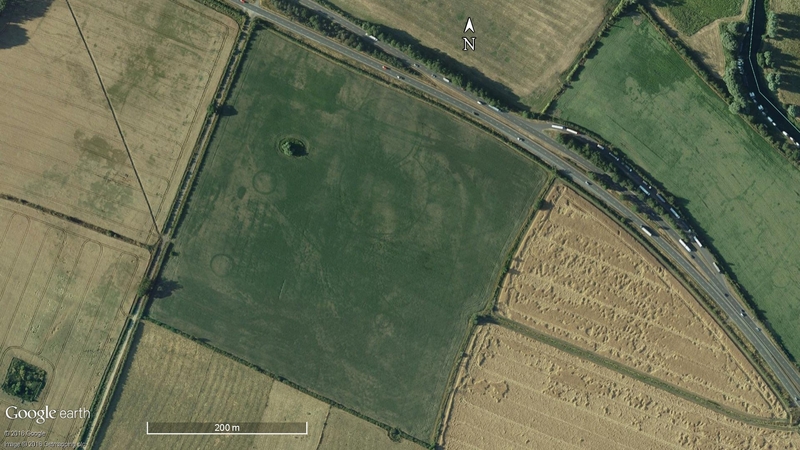 The really curious aspect though, is the empty space in the middle, under the “tumulus”. This seems to have a polygonal linear feature around it, showing as a magnetic positive and therefore either a cut feature, or a brick-built wall. To the east / south-east of the tumulus is a largely open area, somewhat fan shaped in appearance. How very curious. I wanted to check the relationship between the results and the topography so I undertook a topographic survey with the dGPS taking readings every six paces (just under 5m). This differs from using the UAV. The GPS survey will give us a digital terrain model (DTM) which is the actual surface, but at a cruder resolution. 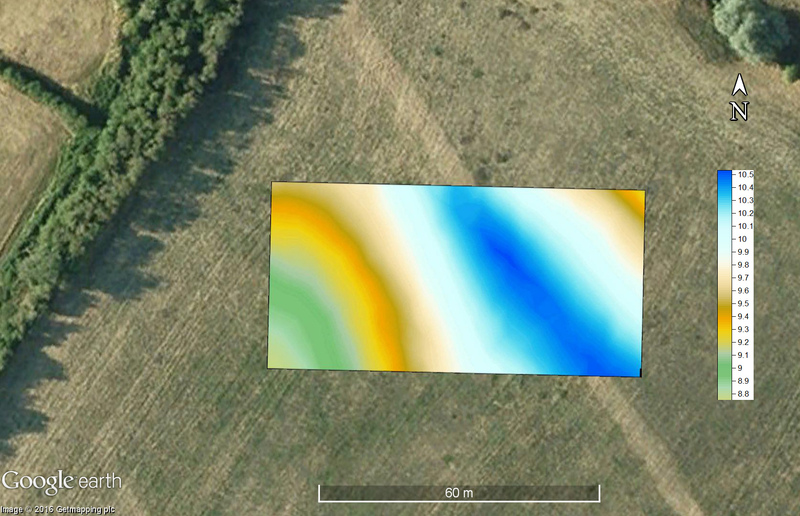 The UAV will give us a digital surface model (DSM) which gives the surface and thus maps the tops of stinging nettle patches and so on, but at a much higher resolution. We saw this at Darrowfield. Neither method is better than the other, it depends on ones aims, but using the UAV is certainly very much quicker in the field! Fig. 14: dGPS topographic survey of the area around the tumulus. As can be seen from Figure 14, the tumulus shows as an elongated feature running SW-NE. My guess is that this shape is a result of plough damage. How does this relate to the mag results? Fig. 15: the topography with the mag data overlain on it and made partially transparent. 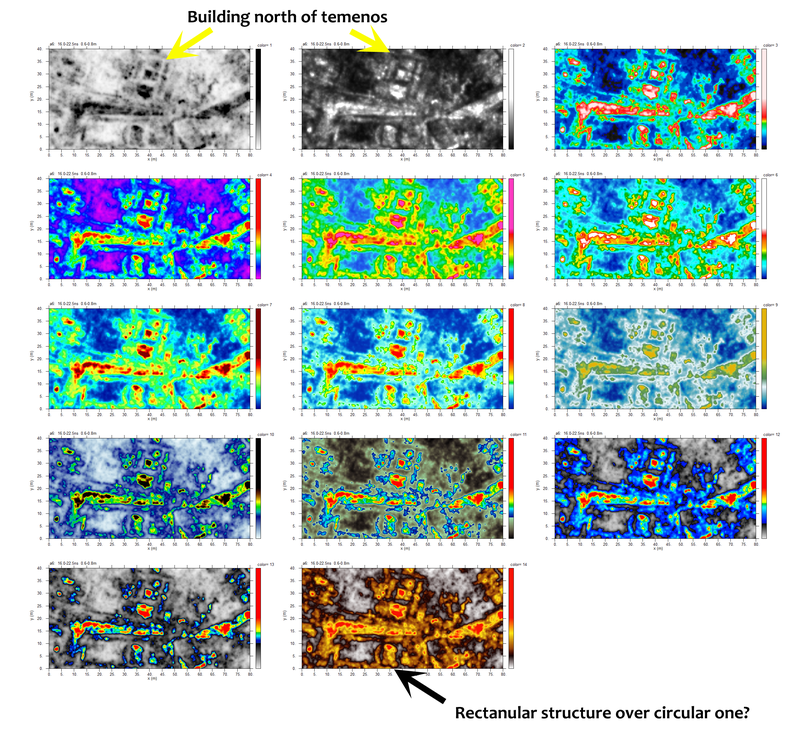 In Figure 15 I have overlain the mag data on the topography, and then made it partially transparent. As can be seen, the mound is smack in the middle of the polygonal magnetic feature. The Earth Resistance survey adds a little to the picture (Fig. 16). Fig. 16: the Earth Resistance survey overlain on the mag data. The resistance data shows little in the way of positive features apart from an area of high readings towards the south. There does seem to be a oval of low resistance readings, normally indicative of a ditch-like feature. There are faint hints of this in the mag data, but they are obscured by other magnetic features running up to the polygonal feature. 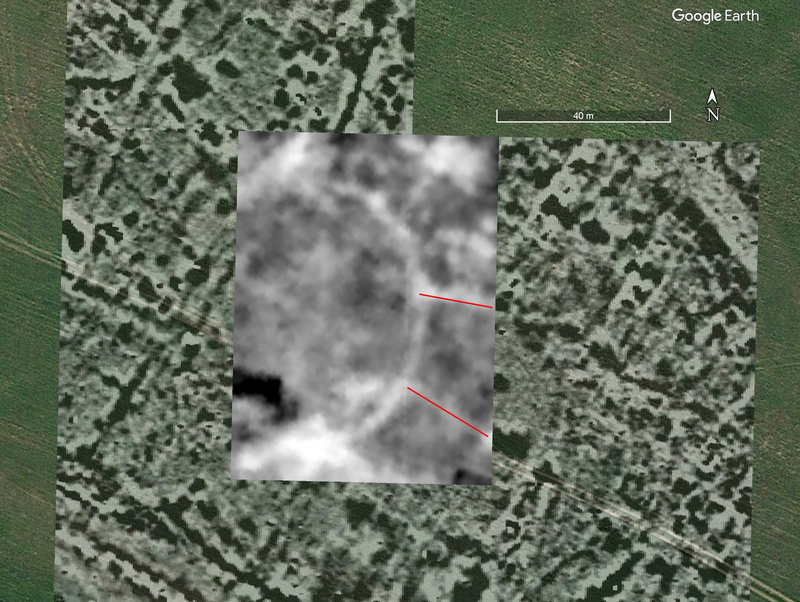 If the ultimate origin of the “tumulus” is a prehistoric burial mound, perhaps the res survey is showing us the outer ditch surviving, in part, below the Roman levels? Fig. 17 shows the resistance survey with contours from the topo survey. Fig. 17: contours overlain on the Earth Resistance data. We managed three 40x40m blocks of GPR data. Unfortunately, the GPR had a glitch in the second grid resulting in a single line of very high values. This glitch caused some problems in the processing. I have tried to get rid of them, but the line still shows, especially in the lower slices. Fig. 18 shows the composite of 16 slices. Fig. 18: all GPR slices from the eastern survey. Surprisingly little shows in this survey. 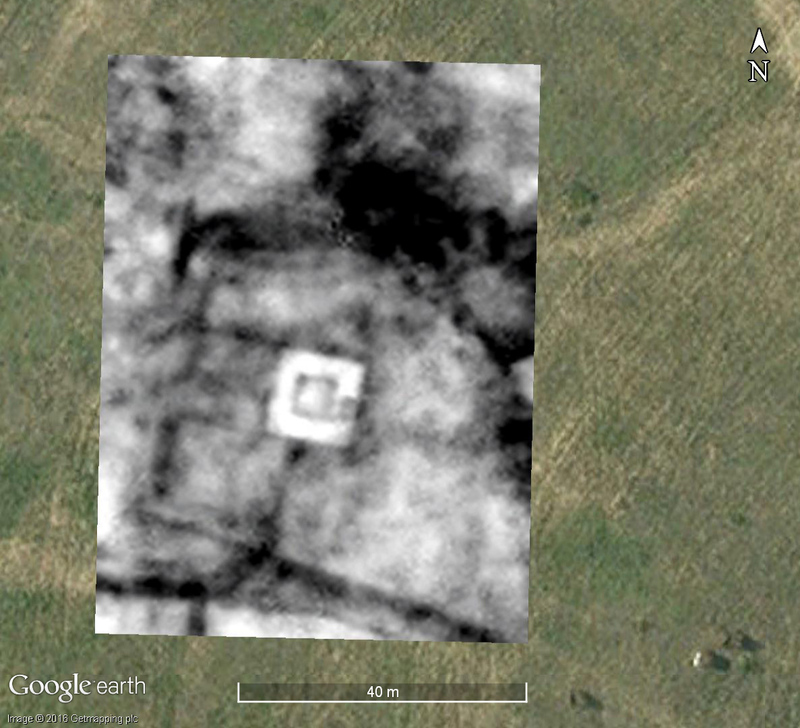 The two main features are the rectangular building which shows from slice 5 onwards, and the general lack of anything much under the tumulus part from some general reflections suggesting some hard material (stones, rubble?) under the mound. Let us look at slice 6 in more detail. Fig. 19: GPR time slice 6. The building towards the south of the image is fairly clear. I wonder if it might be a bath house? The area of higher reflections under the mound have faint hints of straight lines and rectangles, but this only shows in this one slice and my guess is that these are fortuitous rather than archaeology. How does the GPR data relate to the topography? Fig. 20: GPR time slice 6 with the contours superimposed. As can be seen from Fig. 20, the higher reflections do not lie below the main part of the mound but slightly to one side. The building lies outside the polygonal feature seen in the mag data. A slightly deeper time slice (Fig. 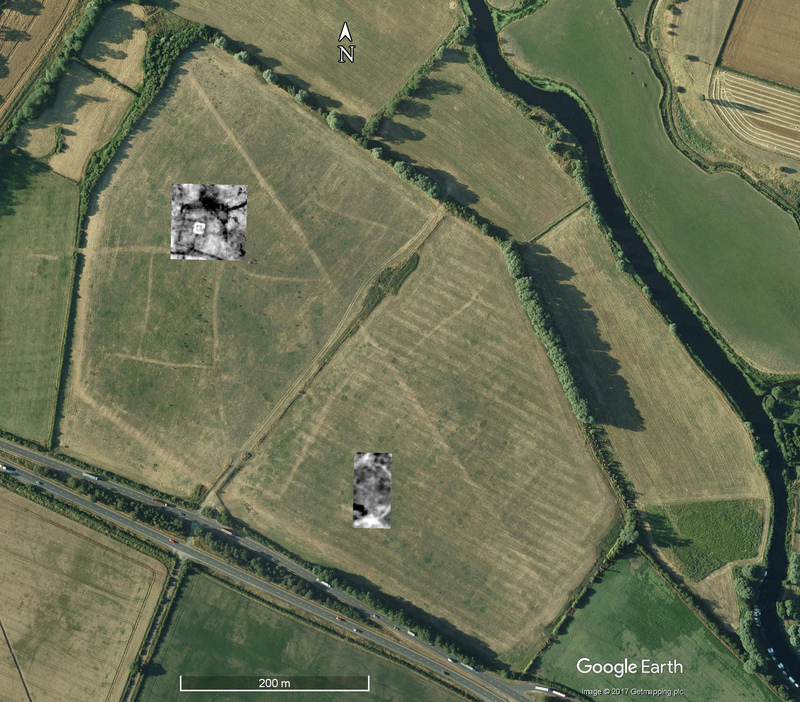 21) shows the strip buildings along Ermine Street starting to show. They appear to be missing their back walls which might be one impact of ploughing. Fig. 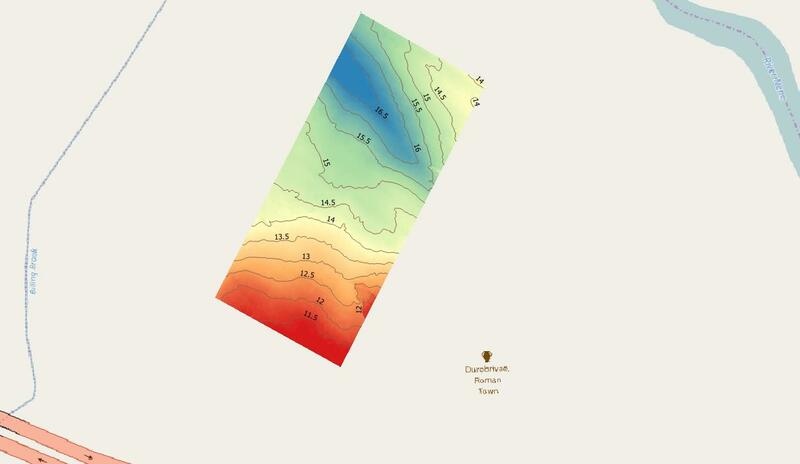 21: GPR time slice 8 with topographic contours. 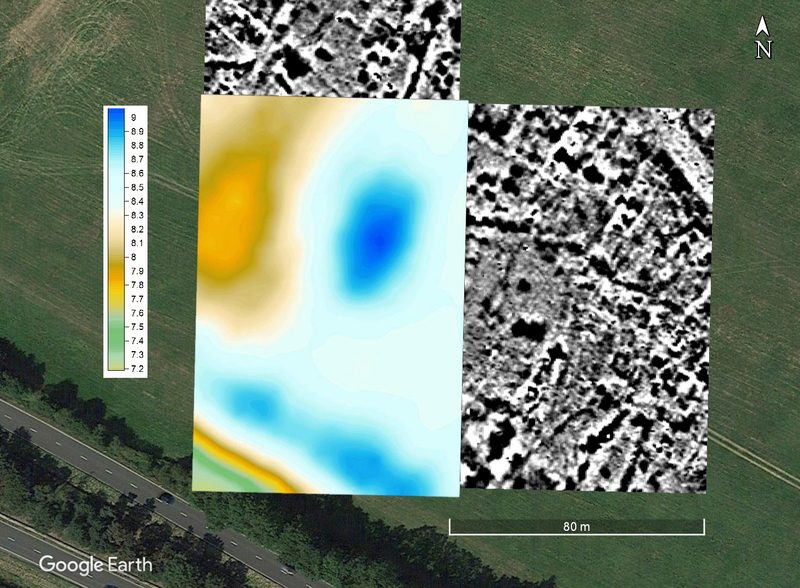 I made a crude interpretation map in Google Earth by marking the polygonal feature from the mag data, the building from the GPR data, and, with some guess work, the outer feature from the Earth Resistance data (Fig. 22). Fig. 22: rough interpretation of the three data sets. 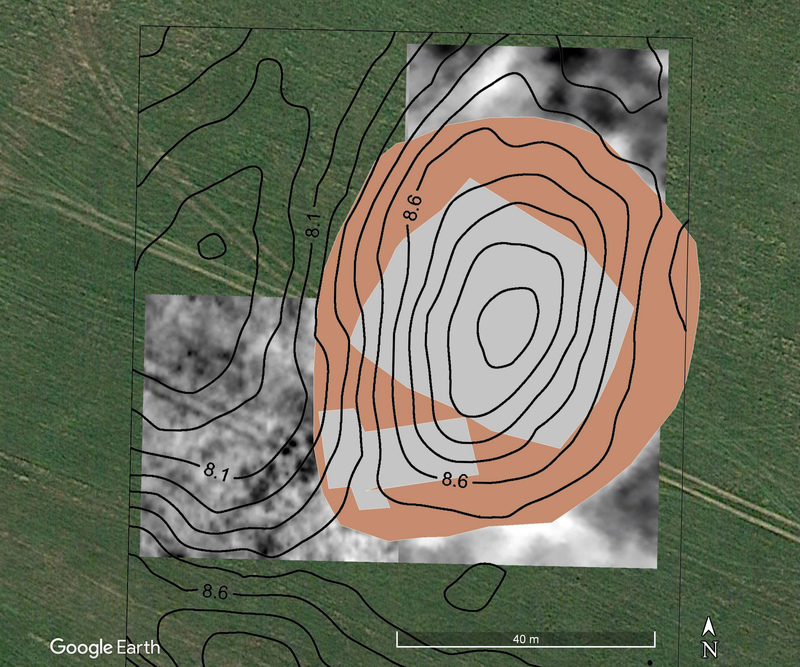 It is impossible from the data to tell if the outer feature from the res survey goes under or around the building, so I may have been a bit generous there. So what is it? One possible interpretation could be that we have a prehistoric feature with a mound and a ditch, presumably a round barrow. The ditch silts up before the Roman occupation. The mound is then fenced off and kept completely clear of structures or negative features like ditches and pits. A building is constructed to the south of this mound, and a viewing area to the east. 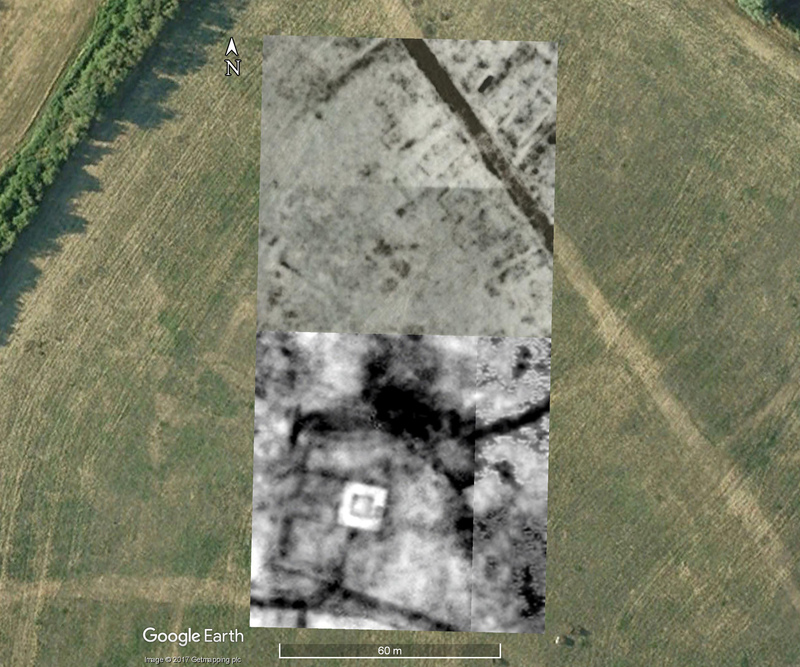 Stephen Upex, solely on the basis of the aerial imagery, suggested that the feature was prehistoric, and re-used as either a amphitheatre in the Roman period or a small castle in the medieval period. With the new data, I think we can rule out the castle (unless it was much more substantial at that date). Although the phrase “ritual” is greatly over-used in archaeology, maybe in this case we are looking at an earlier mound which continued to be venerated into the Roman period? Baths are often associated with religious sites. At this stage, this is purely guesswork at the end of a long blog post. This feature is, really fascinating and quite enigmatic. Extending the earth Resistance and GPR surveys would, obviously, be very helpful. The landscape around Durobrivae is fascinating from an archaeological point of view. 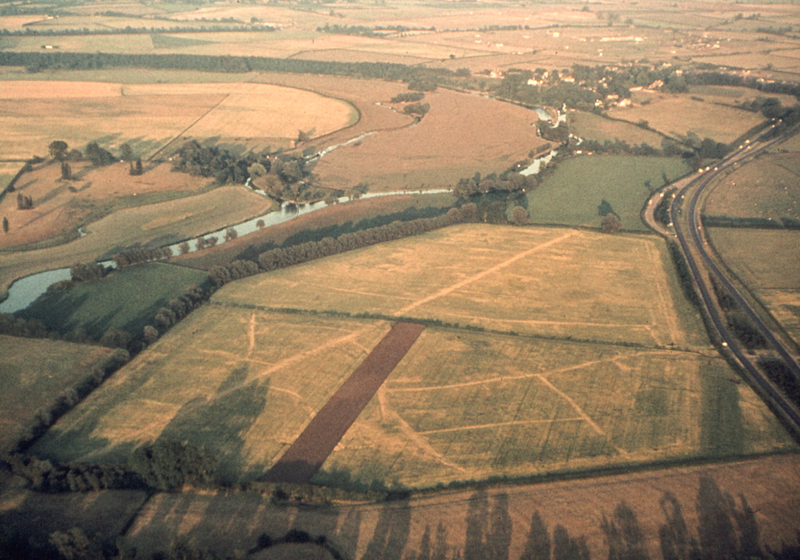 The nearby Roman fort is only known from aerial photographs, and just across the river and the Nene Valley Railway lies the site of Castor (Fig. 23) with its huge Roman building complex. Fig. 23: Castor as seen from Durobrivae. Last, but not least, many thanks to all those who helped push the mag and the GPR, and who aerated the grass with the resistance frame, or flew UAVs to map the topography. Although the site is a long way for all of CAGGs volunteers, the site is both stunning and intriguing and, I think, worth the effort. We hope to return to collect some more data soon. Fig. 24: collecting Earth Resistance data with WAS’s machine. This entry was posted in Durobrivae and tagged ahrc, CAGG, Durobrivae, earth resistance survey, Foerster, geophysical survey, Geoscan, Ground Penetrating Radar, magnetometry, Mala, Roman town, SEAHA, small town, ucl, urbanism, Water Newton on December 10, 2017 by hertsgeosurvey. Just to the west of Peterborough lies the Roman town of Durobrivae. This town is one of the so-called ‘small towns’, i.e., not one of the public towns with an administrative function. It is, however, somewhat larger than some of the public towns such as Caistor-by-Norwich, the civitas-capital of the Iceni. 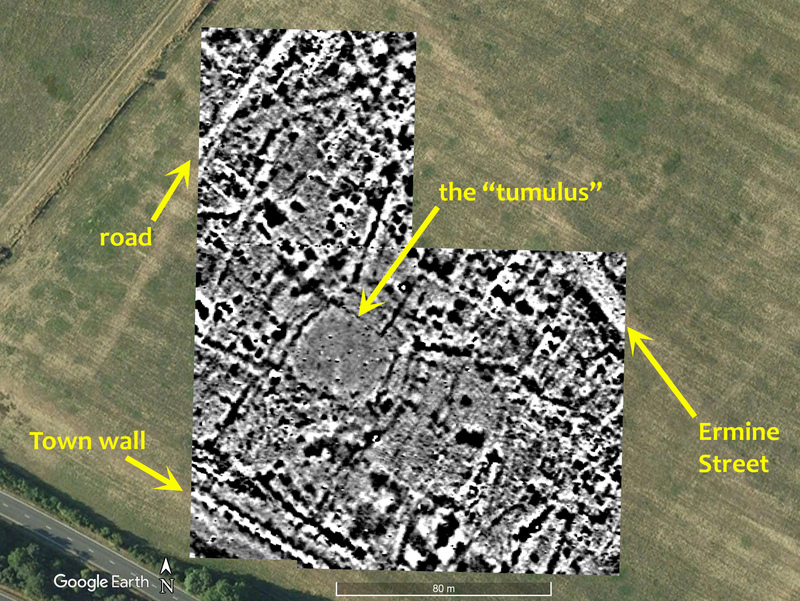 Duriobrivae had a town wall, parch marks from which can be seen on the Google Earth image along with Ermine Street (the straight line through the town from SE to NW) and the irregular street plan (Fig. 1). Fig. 1: Google Earth image of Durobrivae. Oblique aerial photography over the years has revealed much about the interior of the town, as well as extensive suburbs, prehistoric features, villas and so on. Fig. 2 shows an oblique image of the town. Fig 2: Oblique aerial photograph of the town. Reproduced courtesy of Stephen Upex. 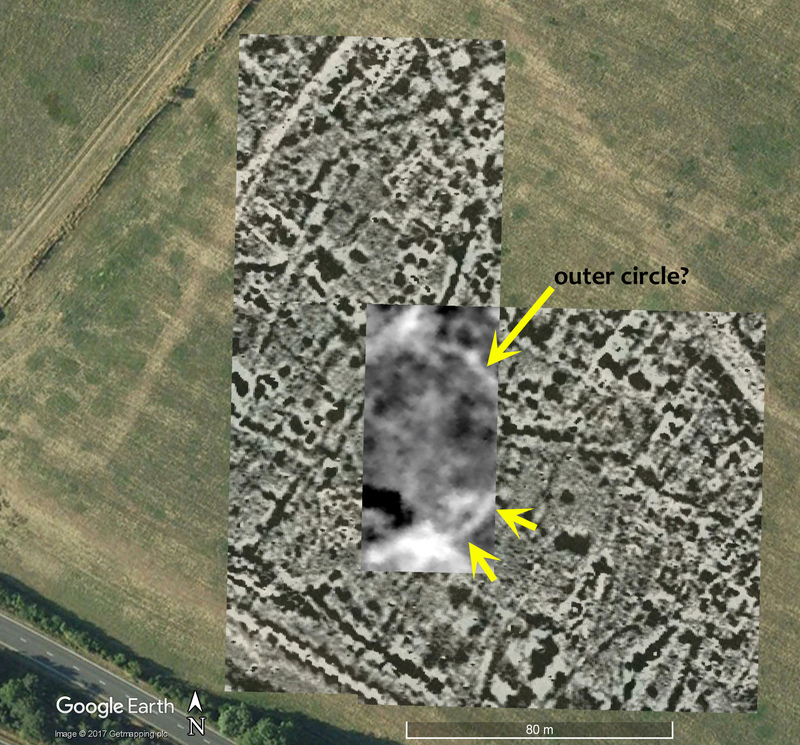 I was particularly fascinated to see a large group of circular features to the south of the town, some of which appear to be the ditches around round-barrows, but others are far too large and are tentatively suggested to be some form of henge (Figs. 3 and 4). Fig. 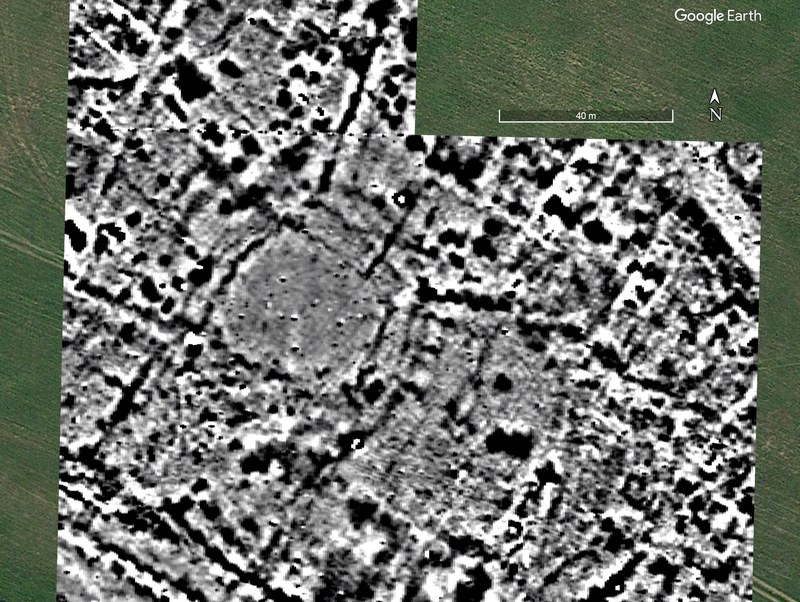 3: Google Earth image of the field to the south of the town showing circular prehistoric features. Fig. 4: Oblique aerial photograph of the field to the south of the town showing the Roman suburbs and earlier prehistoric circular features. Photograph courtesy of Stephen Upex. Ruth Halliwell (WAS), who has worked with CAGG regularly, is working on the town for her dissertation and we arranged to go and team-up with local archaeologists to undertake some survey. It was very much a “proof of concept” trip: which techniques would work best there? Would the surveys add to what could be seen from the air? We undertook three days survey running all three main machines (magnetometry, resistance and GPR), and Peter Alley also used his UAV to take high-level photographs, partly with a view to creating topographic maps. Despite early problems with the mag, we managed to survey an 80m wide, 360m long strip NS across the town. The overall results can be seen in Fig. 5. Fig. 5: the magnetometry survey. There is a great deal going on in the results. Ermine Street shows clearly running across the NE corner of the survey transect and matches the parch mark beautifully. Either side of Ermine Street are a series of buildings with their gable ends onto the road in the approved Romano-British manner. Other streets can be seen, again matching the parch marks. Not all the buildings are so clear, but there are clearly other walls that can be seen in the data. Towards the south, the pattern is more complex. The results could be cleaned-up a little more. In places we were suffering from some stagger, partly as a result of the fine reddy-brown dust that settled over all the machines and their operators (Fig. 6) which, combined with the lubricant we use on the cogs, turned to a sticky slurry. Fig. 6: the red dust all over the GPR. Image courtesy of Mike Smith. 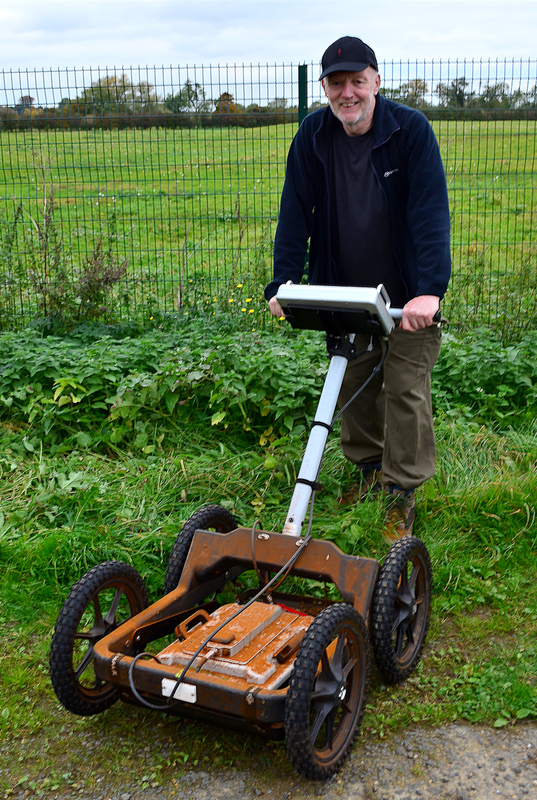 We undertook a radar survey using the Mala GPR we have on loan from SEAHA. Pushing the GPR was quite hard work in the long grass, especially as one goes over the agger on which Ermine Street appears to have been constructed (Fig. 7). The team did, however, manage to complete an excellent six blocks of data. Fig. 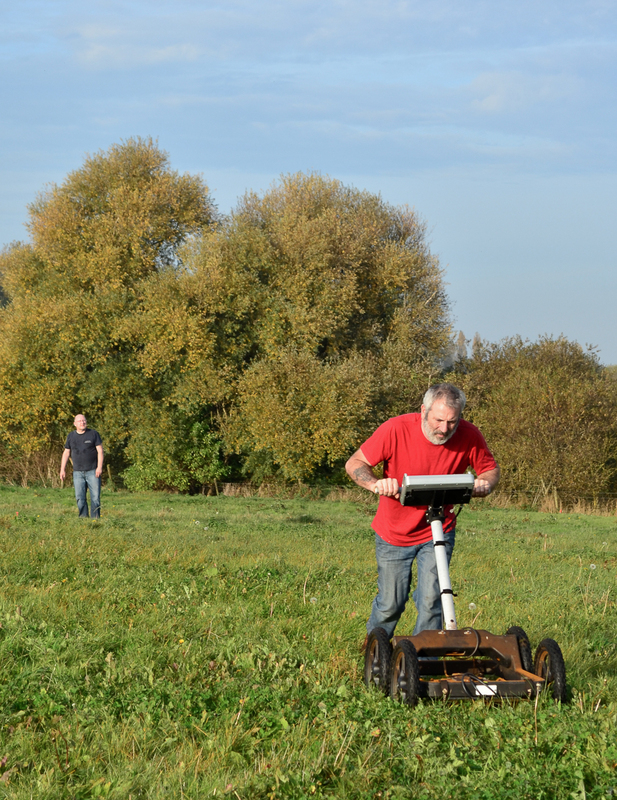 7: Pushing the GPR over Ermine Street. The images on the screen of the GPR shows that we were getting reasonable depth penetration. I created amplitude maps in 3ns thick slices. The third slice map (Fig. 8) clearly shows the surface of Ermine street, but for most of the area surveyed the radar signal is still in the ploughsoil. Fig. 8: time slice 3, 10.5-13.5ns. In the fourth time slice (13.5–16.5ns, Fig. 9) some of the other roads are starting to show, and odd bits of wall. One very curious feature is the lighter coloured band across the middle of the southern area. 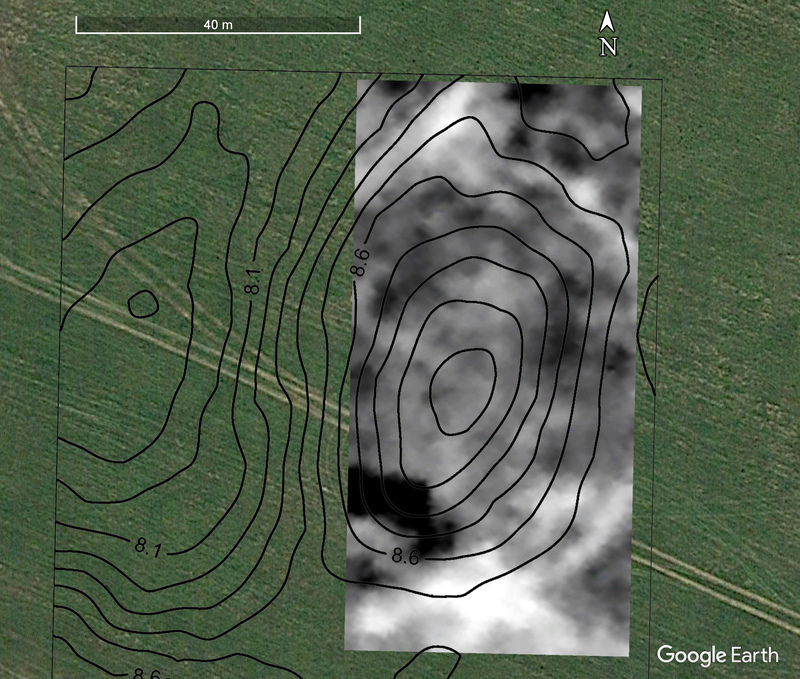 Although it would appear to be related to our grid, our survey was conducted NS across that band. The aerial photograph (Fig. 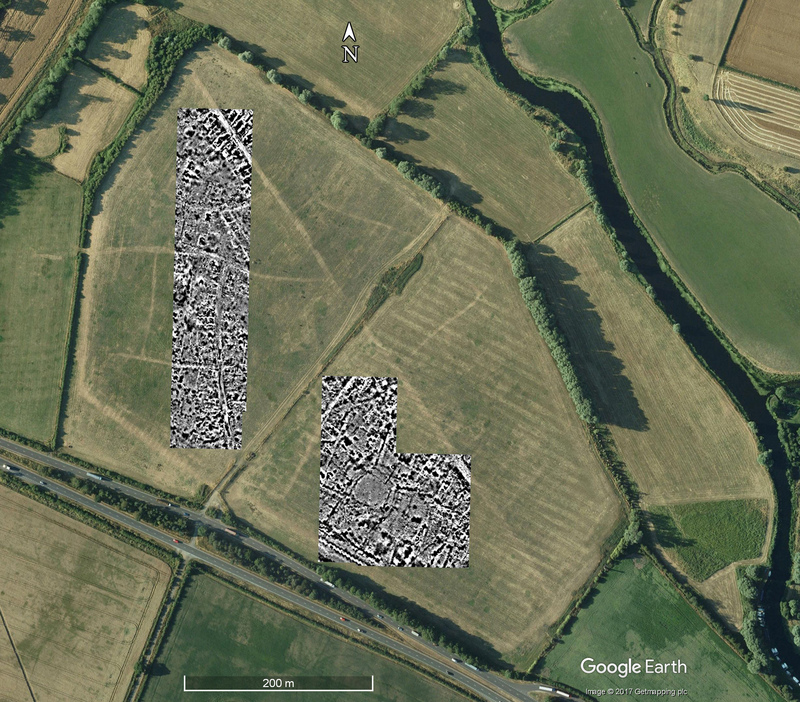 2) does show a band across the field so perhaps this is related to some sort of cultivation pattern? Fig. 9: time slice 4, 13.5-16.5ns. The fifth slice (16.5–19.5ns) shows more details in the buildings (Fig. 10). In the centre of the lower block is a square feature. 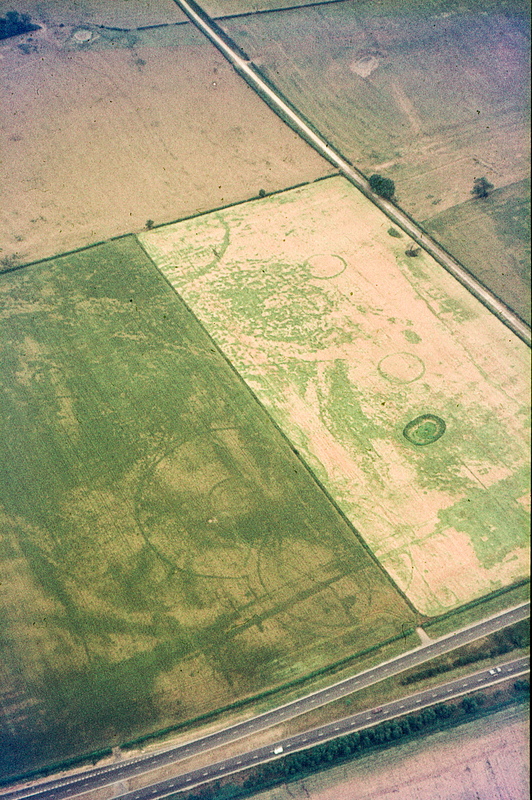 This is the Romano-Celtic temple known from aerial photographs. This type of temple, well-known from many sites across the north-western provinces of the Roman Empire and consists of two concentric squares, usually reconstructed as an inner sanctum and an outer ambulatory. The two roads the the north and south of the temple appear to mark the edges of the temenos or sacred precinct. There is a hint of a possibly paved area to the west of the temple, and a solid feature between the internal and external walls to the east. 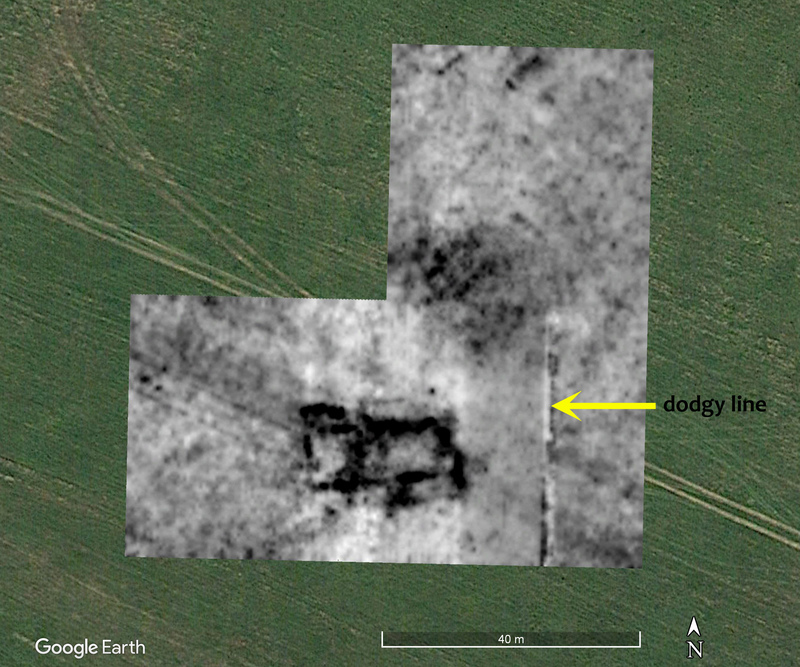 In the northern block there are hints of the walls on either side of the road as seen in the magnetometry data. Fig. 10: time slice 5, 16.5-19.5ns. 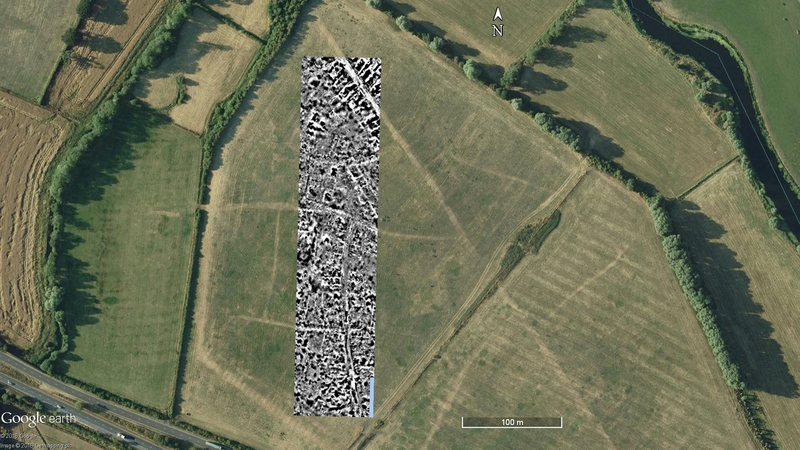 In the sixth time slice (19.5–22.5ns) we can start to see some of the buildings along Ermine Street not, as I had expected, as black ‘high amplitude’ features shown in black i.e., stone walls, but as low amplitude features, i.e., areas which have fewer items that would reflect radar waves (Fig. 11). At Verulamium, I have interpreted these as where the stone foundations have been robbed, but here we know less about the construction techniques used. Part of the difficulty is that Ermine Street is on a quite marked bank which means the radar has a greater depth of deposits to penetrate. I undertook a topographic survey of just the northern block area (Fig. 12) and in the future will be able to process the GPR data taking into account the topography. Fig. 11: time slice 6, 19.5-22.5ns. Fig. 12: topographic survey of the northern block. In the seventh and eighth time slices (22.5–25.5ns, 25.5–28.5ns), the GPR radar waves are starting to attenuate and we are getting quite faint reflections, but some of the deeper foundations show in these lower time slices (Figs. 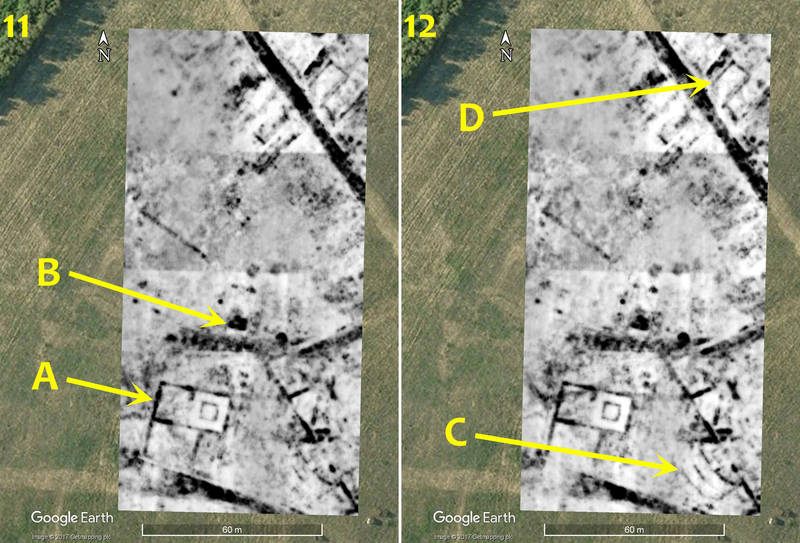 13–14), For example, some of the buildings along Ermine Street start to show very well in Fig. 13, and the outer wall of the Romano-Celtic temple shows very well in Fig. 14. Fig. 13: time slice 6, 22.5-25.5ns. Fig. 14: time slice 6, 25.5-28.5ns. 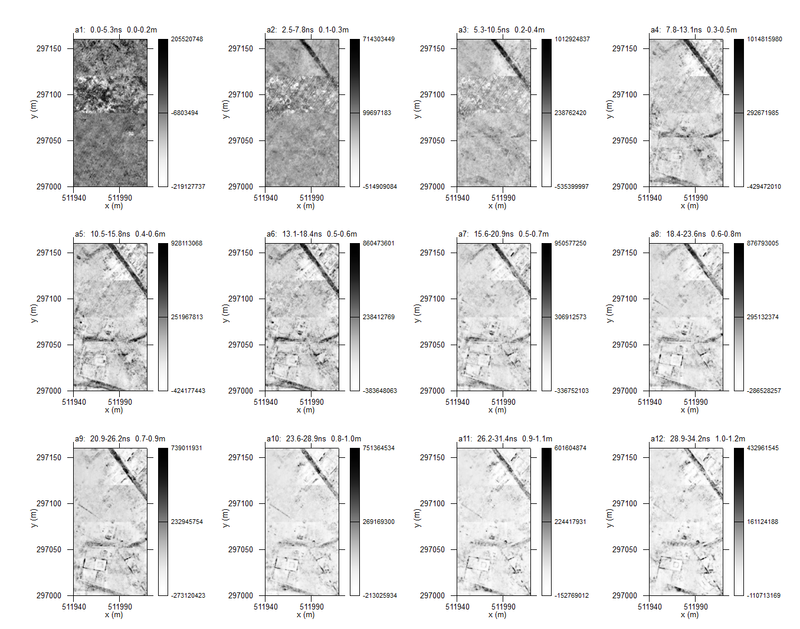 There is a great deal more which can be extracted from the GPR data, especially by looking at the radargrams (the vertical slices) and comparing them to the time slices. 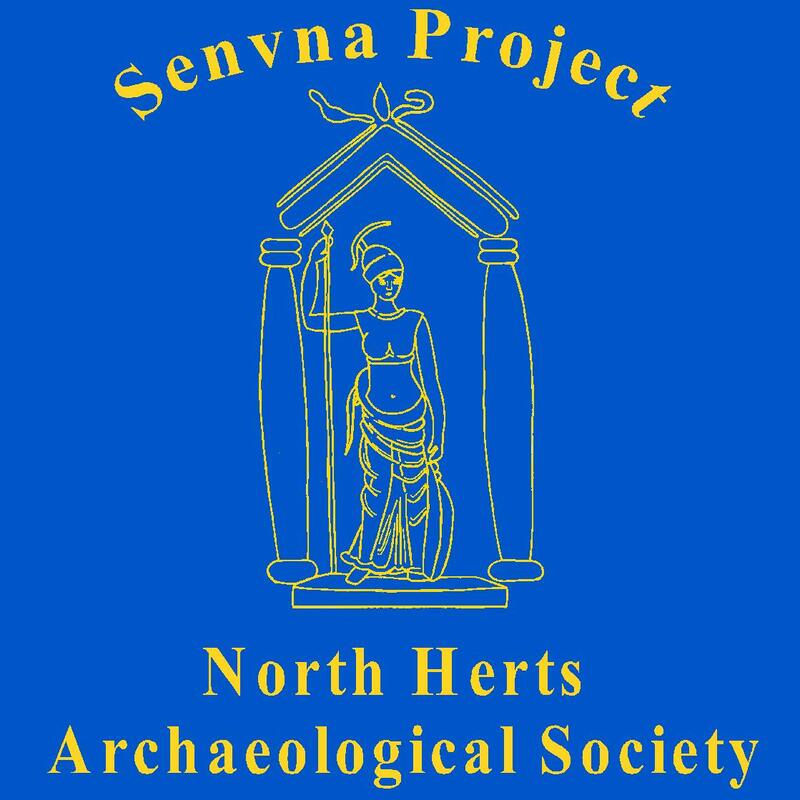 The results are less “black and white” than at Verulamium and quite complex, but there is a great deal going on in this data which will take a bit of work to tease out all the details. As well as the magnetometry and radar surveys, we undertook a resistance survey using UCL’s new RM85 meter (Fig. 15). We took readings every 50cm. We managed to survey an area 60x by 80m which had also been surveyed using the GPR and the magnetometer. Fig. 15: Richard Cushing and Stephen Upex working on the resistance survey. The result of this survey was quite surprising (Fig. 16). Fig. 16: the earth resistance survey. 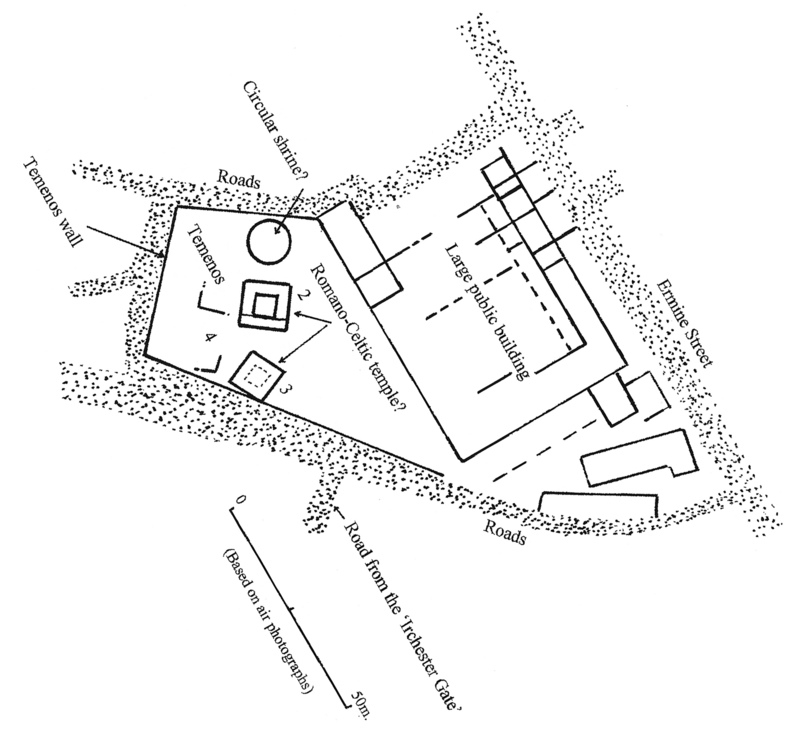 The square within a square plan of the Romano-Celtic temple could not have been more obvious. 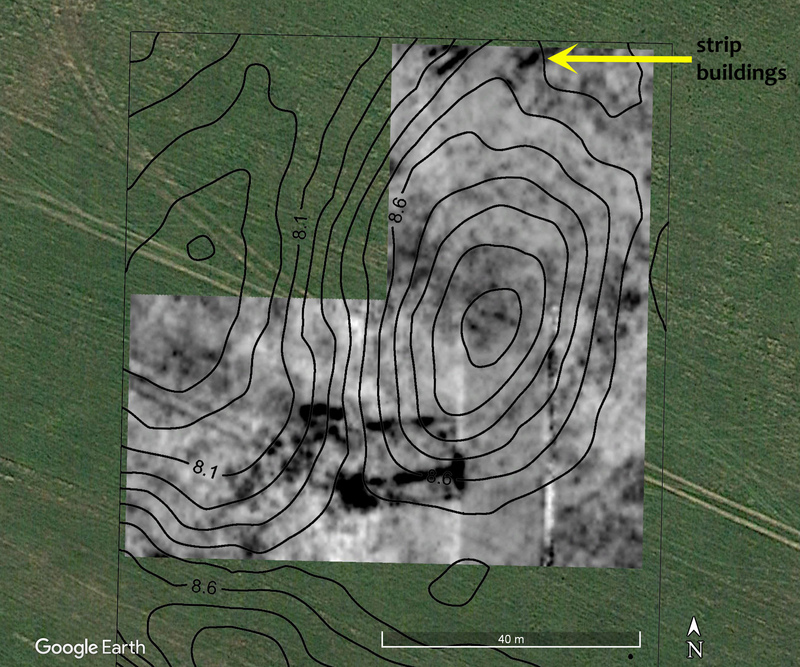 The small room on the eastern side, partially seen in the GPR survey, shows clearly. The temenos is also quite clear. A spectacular result, but one that raises a question. Why is the inside of the temple such low resistance? Normally, low resistance like this is related to water retention. Is the outer wall of the temple causing water to pool within the wall? It is useful to compare the three surveys (Fig. 17). Fig. 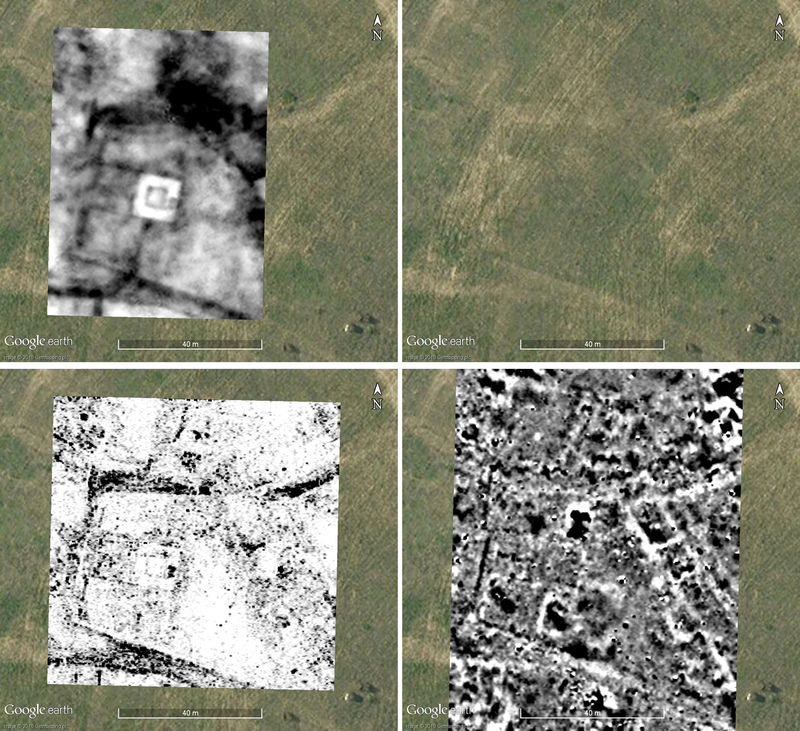 17: comparing the three survey techniques and the parch marks in the area of the temple. It will take a bit of work to draw-up a composite interpretation plan. 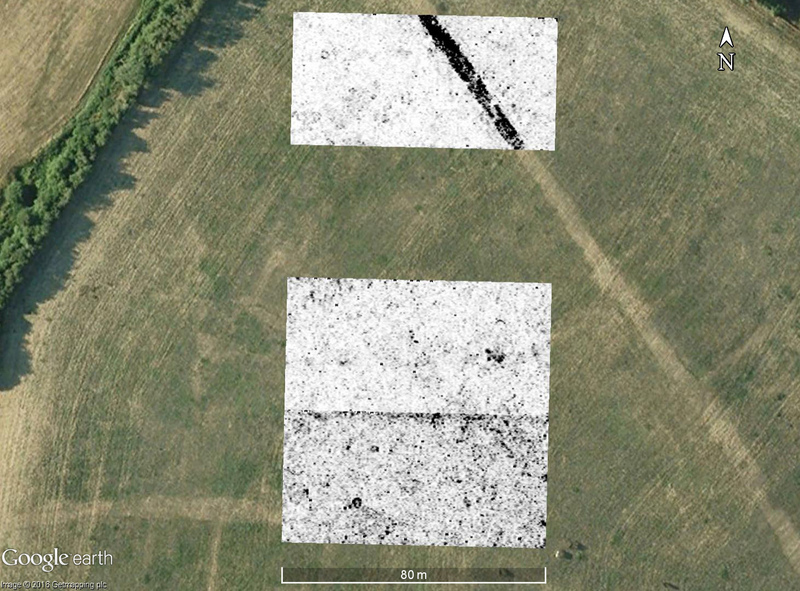 Peter Alley also undertook some surveys with his UAV (Fig. 18). Fig. 18: Peter Alley using his UAV to map the site. As well as taking high-level images of sites, the UAVs pictures can be used to create topographic models using a technique called “Structure from motion”. Fig. 19 shows a topo plan of part of the site derived from the photographs. The actual heights vary from my plan because the UAV’s plan needs to be corrected against some control points, but the relative heights are great. This technique is going to prove very useful in future. Fig. 19: Topo map in QGIS derived from the UAV’s aerial imagery. The aim of this three days of fieldwork was simply to see which survey techniques would provide useful information at this site. The answer is: all of them! We already have a huge amount of data to examine in more detail, and a great deal of thinking to do. 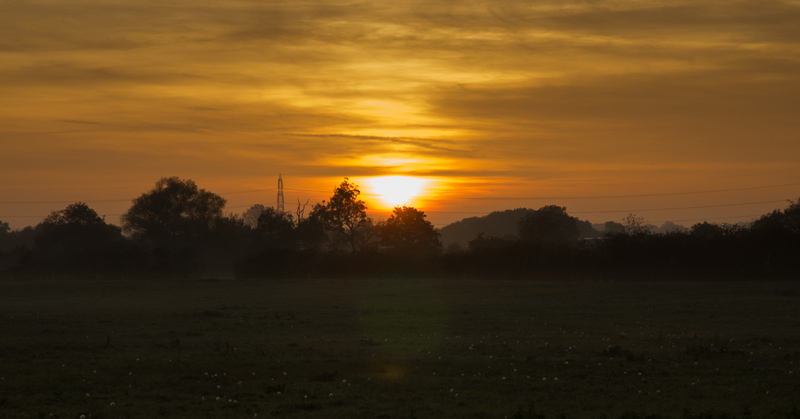 It certainly seems that a more extensive programme of geophysical survey would add to our knowledge of the town greatly, as well as other archaeological features such as the “henges” to the south. As always, many thanks indeed to everyone who came to help, especially Mike Smith for transporting and running the GPR, and Jim West for helping to run the mag. This was a great team effort between local group members and CAGG, and exactly what our group exists to do. Fig. 20: the end of day. This entry was posted in Durobrivae and tagged Durobrivae, earth resistance survey, GPR, Ground Penetrating Radar, magnetometry, Peterborough, Roman town, small town, structure from motion, topographic survey, UAV, urbanism, Water Newton on November 5, 2016 by hertsgeosurvey.